Discussing social and economic matters in the first century BC, Cary and Scullard say that none of the great fortunes of the period were derived from manufacturing. There wasn’t enough wealth in Italy to support large-scale manufacturing. So most Roman businessmen were involved in tax-farming or money-lending. Roman bankers loaned to cities and kingdoms outside Italy, to enable them to pay the taxes levied by Rome; Roman bankers often charged 25-50% interest. But Roman bankers didn’t loan to the Roman government; the Roman government met expenses through taxation and confiscation; there was no national debt. Some Romans, like Crassus, made fortunes in real estate, buying estates from the government after a partisan massacre (such as Sulla’s proscriptions), then selling the estates in calmer times. In 50 BC, the wealthy were a tiny fraction of the Roman population, while 300,000 Roman residents received free corn from the government. One of the government’s chief tasks was to keep corn flowing into Rome from Sicily, North Africa, etc. The Roman masses were relatively satisfied because they received free corn, they received bribes from vote-seeking politicians, and they were often part of a web of patron-client relationships. During the first century BC, the upper class began living more ostentatiously. Often they owned a house on Rome’s fashionable Palatine Hill, and another house to escape summer heat, usually in the Bay of Naples (two popular towns in the Bay of Naples were Baiae and Puteoli, known today as Baia and Pozzuoli). Sometimes they owned a country house in the foothills of the Apennines, where summer heat was less oppressive. Cicero, who wasn’t one of the “super rich,” owned “at least eight country-houses.”1 Meanwhile, the poor were crowded into tall, poorly-built tenements. “Cicero tells how in 44 BC two tenements he owned collapsed and cracks had appeared in others,” prompting the tenants and even the mice to flee. In earlier times, Romans like Cato the Elder were at home on the farm, but in the first century BC, the aristocracy became accustomed to urban living, and became bored with rural life. The masses were entertained with frequent gladiatorial combats and animal combats. Turning to architecture, our authors say that, in some respects, Roman builders went beyond the Greeks. 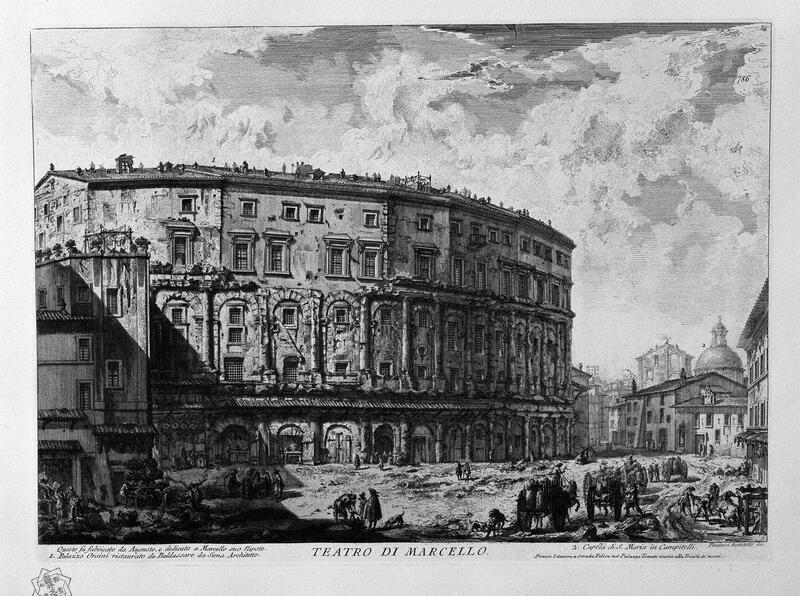 While Greek theaters were built into hillsides, and had a semi-circular shape, the Romans managed to build free-standing, oval-shaped theaters, supported by arches. The Roman theaters were called “amphitheaters,” from the Greek amphi meaning “both,” since the action could be viewed from both sides. 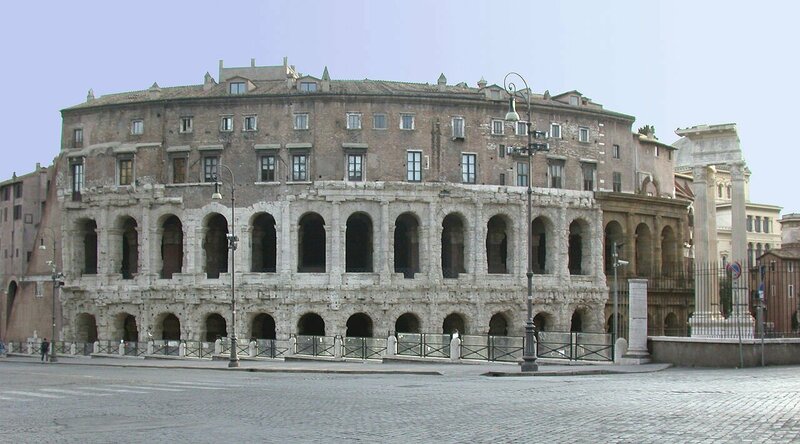 Amphitheaters were better suited for viewing gladiatorial combats than dramas, hence the development of the amphitheater may be a sign of the decline of popular culture. 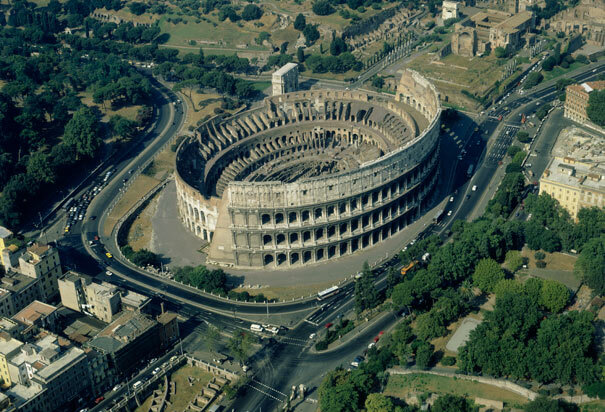 The Colosseum in Rome is an example of an amphitheater. 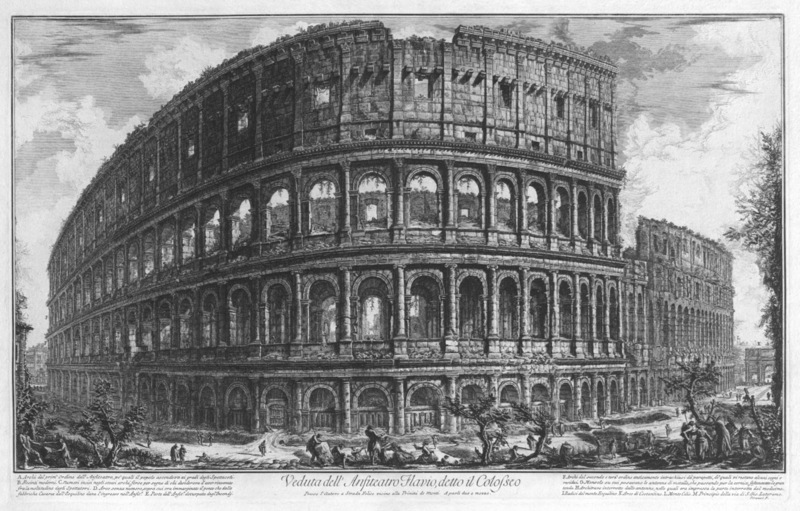 he was somewhat disappointed, because it didn’t quite equal Piranesi’s Rome. and note how it’s supported by the hillside, rather than by arches. 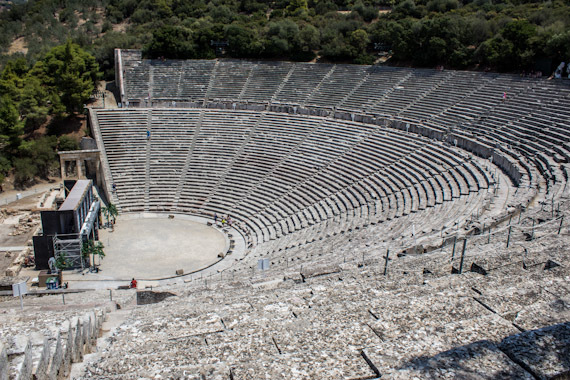 It was built around 350 BC, seats 14,000 spectators, and is famous for its acoustics. In the first century BC, Roman education focused on Greek and Latin literature. An educated Roman was expected to be a master of Greek, as an educated Englishman in 1700 was expected to know French, and an educated German today is expected to know English. The young Roman completed his education by studying in Greece; both Cicero and Caesar studied rhetoric at Rhodes, and Cicero studied philosophy at Athens. Greek teachers often went to Rome, and taught classes there. In the provinces, especially the western provinces, Latin was spreading and displacing local dialects, eventually becoming the mother of the Romance Languages. Roman scholars, such as Varro, wrote lengthy treatises on grammar and vocabulary; such treatises helped to standardize Latin, and bring it into wide use. While Greek remained the most widely used language in the Eastern Roman Empire, Latin became widespread in the Western Empire. One might contrast Posidonius with Lucretius, who believed that the world is “governed by the mechanical movement of atoms,”7 not by a mysterious “sympathy.” Perhaps the contrast between Posidonius and Lucretius is part of a larger contrast between Stoicism (represented by Posidonius) and Epicureanism (represented by the materialistic Lucretius). During the first century BC, the State religion was stagnating, and losing its hold on the people. Politicians abused divination for their own benefit. New religions were kept out. The first Jewish immigrants in Italy were expelled for proselytizing in 139 BC. In 58 BC, altars to Isis, an Egyptian goddess, were destroyed. In poetry, Roman gravitas and reserve was giving way to self-revelation, as in the poetry of Catullus, who was born in 84 BC, fourteen years before Vergil. Catullus expressed “each up-welling emotion — a gust of anger at Caesar’s high-handed politics, a surge of joy over the scenery of Lake Garda, the transports and the anguishes of young love.”9 Our authors speak of Catullus’ “glorious spontaneity.” Catullus was from a prosperous equestrian family in Verona. His father entertained Caesar when Caesar was proconsul of the region. Later Catullus accused Caesar, in one of his poems, of having an affair with his engineer, Mamurra. When Catullus apologized, Caesar invited him to dinner. Cary and Scullard point out that Rome had no postal system, just as it had no police department and no fire department. There were, however, private messengers (the tax farmers developed an efficient messenger system). 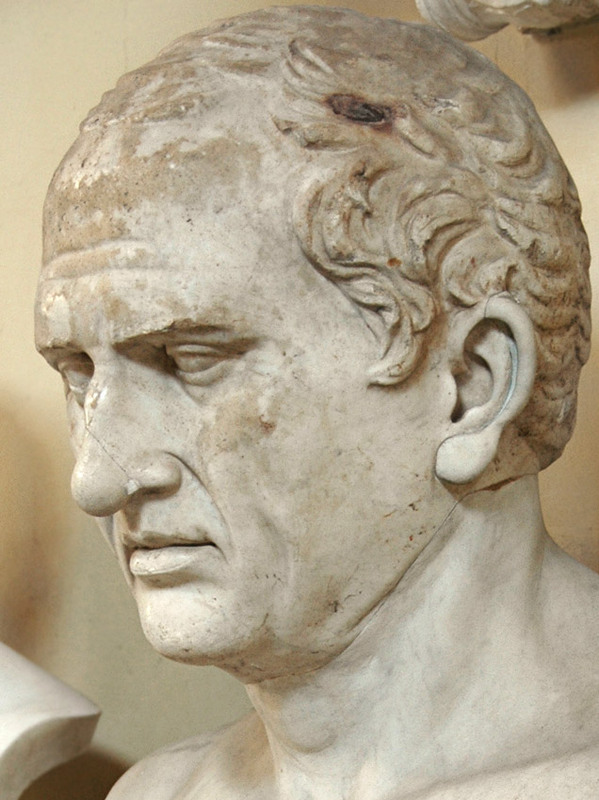 Letter-writing became a branch of literature, and many of Cicero’s letters survive. Through Cicero’s letters, our knowledge of life during the late Republic is better than our knowledge of any other period of Roman history. Cicero’s friend Atticus had slaves who copied books, including Cicero’s books, enabling Cicero to reach more readers. There were also publishing houses in Rome that disseminated books. When Octavian returned to Rome in 29 BC, he was acclaimed as victor, and as the bringer of peace. Italy longed for stability, after decades of civil war. because it was found at Prima Porta, near Rome, in 1863.
that had been captured from Crassus in 53 BC. According to Cary and Scullard, Octavian had to retain control of all the legions, lest an ambitious commander start a civil war. In other matters, though, he wanted to share power, he didn’t have Caesar’s boundless energy. He wanted to supervise, while leaving the details in the hands of the Senators and Equestrians. Later he received the title Pater Patriae, Father of the Country. 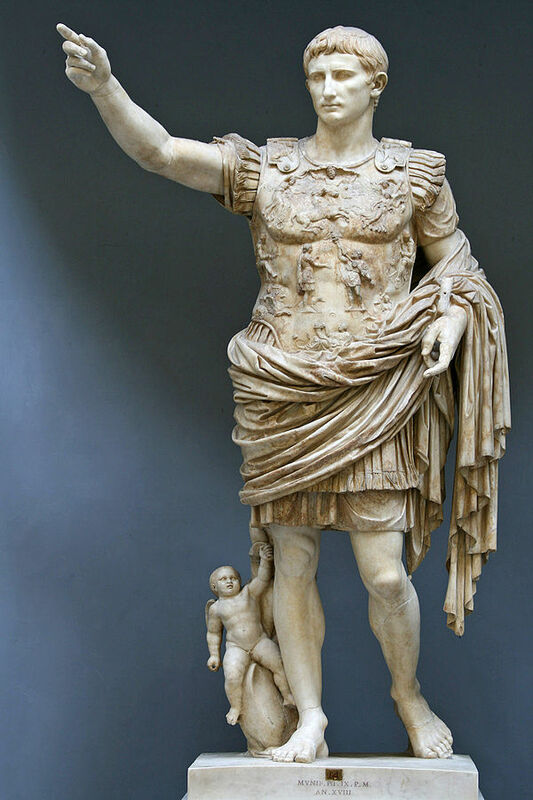 Augustus claimed that he had restored the Republic. He claimed to be, not a dictator, but merely the first among equals (primus inter pares). He claimed that his power was based, not on force, but on the will of the people (consensum universorum). And there was some truth to these claims. His rule is sometimes termed a “Principate,” and he’s sometimes referred to as Princeps, first citizen, or as “Prince of the State” (Princeps Civitatis). He tried to act like a republican magistrate, rather than a king; his house, like his clothing, was that of an ordinary noble. But his control of the armed forces made him more than an ordinary magistrate; he was the commander (imperator). In 27 BC, Augustus left Rome for three years, so the new constitutional arrangements could begin to take root. He returned to Rome in 24 BC, and the next year he had to deal with a conspiracy against his life. Then he fell seriously ill (his health was never robust), and he gave his signet ring to Agrippa, believing that death was near. Augustus developed a bureaucracy to govern his provinces, and carry out his policies. This bureaucracy grew under later emperors, becoming a key element in Roman government. Governors and high officials were often referred to as “Prefects,” while treasury officials were referred to as “Procurators.” Imperial officials often served for long periods; they were professional bureaucrats. Alongside this imperial bureaucracy were the republican magistrates who governed the Senate’s provinces, and usually served for one year. In addition to the emperor’s staff of “pencil pushers,” there was also a staff of soldiers, who guarded the emperor and carried out his commands. These soldiers were called “Praetorian Cohorts,” and their commanders were called “Praetorian Prefects.” In later times, the Praetorian Prefects became powerful figures, even rivals of the emperor. Anticipating this, Augustus had two Praetorian Prefects of equal standing, and he chose Praetorian Prefects, not from the Senatorial class, but from the lower Equestrian class. Cary and Scullard give Augustus credit for sharing power, and for not establishing an “absolute despotism.” They give him credit for establishing a system that lasted for “more than two centuries.” They give him credit for making an honest attempt to find a middle ground between the despotism of the Triumvirate and the chaos of the Republic. Augustus boasted that he had found Rome a city of clay, and left it a city of marble. One of the many notable buildings that he left behind is the Ara Pacis (Altar of Peace). Augustus’ friend Agrippa served as aedile (building supervisor), and was active in restoring old buildings and constructing new ones. Agrippa built aqueducts and public baths. He even took a boat up the Cloaca Maxima (Supreme Sewer). The Tiber was widened to prevent flooding. Roads were rebuilt, and maintained by a board of curatores viarum. Toward the end of his reign, Augustus finally established, in Rome, a fire department and police department. He also improved security throughout Italy, checking the incursions of raiders from the north, and controlling the robbers who had become common in the countryside during the second Triumvirate. Augustus established a postal service, with fresh horses kept along the routes; but the postal service was only for the governing class, not for the general public. Augustus also organized the import of grain from Sicily, North Africa, and Egypt, and reduced the number of people on the “grain dole” to 200,000. Before the Battle of Actium, there was a series of wars and upheavals, which resulted in population decline. During Augustus’ long reign, this decline was reversed, and the population of Italy rose sharply. Augustus tried to encourage this process by punishing people who didn’t marry, punishing people who married but didn’t have children, rewarding people who had children (especially those who had three or more children), and punishing adultery. One of the marriage laws that Augustus enacted was the Lex Papia Poppaea, which was named after the two consuls who introduced it. Ironically, these consuls were themselves unmarried! Augustus’ marriage laws proved impossible to enforce; Cary and Scullard describe them as the “least successful” of all Augustus’ reforms. Many people — including the poets Horace and Vergil, and Augustus’ wife Livia — were given the ius trium liberorum (right of three children) though they didn’t have three children. Augustus tried “not only to increase the numbers of the Italian stock, but also to prevent its too rapid dilution with alien elements.”17 Many of these “alien elements” were found in the slave population, so Augustus made some attempts to separate slaves from non-slaves. He tried to restrict the emancipation of slaves, and he barred Senators and their offspring from marrying freed slaves. Augustus was conservative by nature. This may explain why he resisted moral laxity, and passed laws against adultery. It may also explain why he liked to preserve old political forms, preserve the traditions of the Republic. Augustus’ conservatism also explains his attitude toward religion. He repaired neglected temples, and revived neglected ceremonies. In 17 BC, he performed an “expiatory ceremony” called the Ludi Saeculares, which was supposed to be performed every hundred years. In his attempt to revive traditional morality and religion, Augustus received “immense help” from the poets Horace and Vergil, and from the historian Livy. 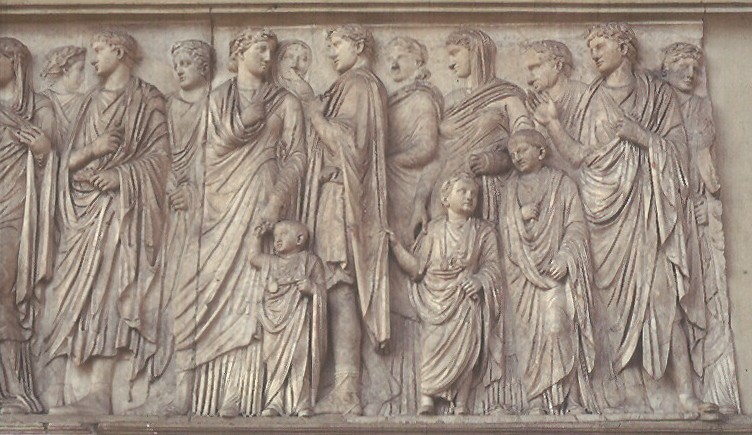 According to Cary and Scullard, these writers weren’t simply trying to please their patron; they were expressing their “genuine feelings,” Horace’s odes were “genuinely patriotic.”19 Augustus himself was genuinely patriotic and genuinely religious, but his religion was little more than patriotism; he worshipped the “state-protecting deities of Rome.” Though friendly to the Jews, Augustus was generally hostile to foreign worships, whether northern Europe’s Druidism or Egypt’s Isis cult. He carefully preserved the Sybilline oracles, which were part of Roman tradition, but he destroyed all other prophetic texts.